We all are familiar with Popup Windows which are great way to show alert, notice, news, information, errors, modal popups, modal windows, dialog or take inputs. Earlier I had posted about jQuery Photo Gallery Plugins, Plugins to create Pinterest like layout and jQuery Page Flip Plugins. So in this post, I have gathered Top 10 jQuery Popup window plugins and tutorial which can be easily integrated in your website. Enjoy..
Speedo Popup is a powerful popup / modal plugin. It`s fully RESPONSIVE and is designed to provide an optimal viewing experience. Also has compatibility for HTML5 and CSS3 and has multiple predefined SKINS or effect transitions. COOKIE and VIDEO SUPPORT are another amazing features. Likno Web Modal Windows Builder is not only a plugin but it is a powerful application (with a visual WYSIWYG interface) for creating stylish and feature-rich jQuery popup windows/dialogs for your web pages, with minimal effort and coding. You can use simple text, HTML, images, videos, ajax, flash, opening/closing effects, colors, slideshows, auto-play, automatic opening "on page load"(and more!) to create any type of popup window/dialog, such as: html window, html popup, jQuery popup, modal popup, modal dialog, jQuery modal, modal window, etc. All modal windows are cross-browser and work alike in all browsers. Reveal is awesome because it's easy to implement, is cross-browser compatible with modern browsers (with some graceful degradation of course) and lightweight coming in at only 1.75KB. bPopup is a lightweight jQuery modal popup plugin. It doesn't create or style your popup but provides you with all the logic like centering, modal overlay, events and more. 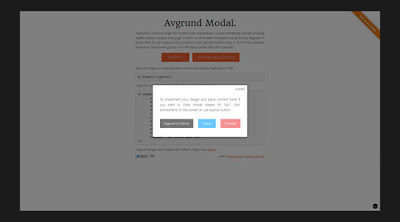 Avgrund is a jQuery plugin for modal boxes and popups. It uses interesting concept showing depth between popup and page. It works in all modern browsers and gracefully degrade in those that do not support CSS transitions and transformations. This is an easy to use jQuery Plugin to integrate YouTube videos on your page by displaying a dialog box pop-up. He used jQuery UI Dialog Widget context that the container rather than reinventing the wheel. dialogue jQuery UI is a robust mechanism for cross-browser to display a dialog box pop-up with the title bar, including a mobile box with modal behavior. The jQuery UI Dialog plugin uses the jQuery UI Framework to build and give style which includes colors and background as well. SIMPLEMODAL is a small plugin to create modal windows. It can be used to generate alert or confirm messages with few lines of code. 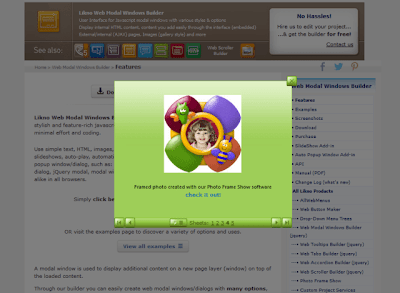 leanModal is lightweight jQuery plugin to create modal windows. It is quite flexible. It doesn't support Ajax, iFrame. jqModal is a plugin for jQuery to help you display notices, dialogs, and modal windows in a web browser. It is flexible and tiny.